Le Fort fractures account for 10-20% of all facial fractures. They result from exposure to a considerable amount of force. Motor vehicle accidents (MVAs) are the predominant cause; other causes include assaults and falls. With seatbelt laws and the increased use of airbags by auto manufacturers, the overall incidence of midface fractures has decreased. Coronal CT of a patient with right Le Fort III fracture and left Le Fort II fracture. Axial picture. Note bilateral pterygoid plate fractures. Three-dimensional reconstruction of a patient with right Le Fort I fracture and a left Le Fort II fracture. Coronal CT demonstrating a right Le Fort I fracture and a left Le Fort II fracture. Rene Le Fort described the classic patterns of fracture in his 1901 work. Le Fort's experiments consisted of dropping cadaver skulls from several stories or striking them with a wooden club. He found 3 distinct fracture patterns, which he termed the linea minoros resistentiae. Simply stated, in the Le Fort I fracture, the palate is separated from the maxilla; in the Le Fort II fracture, the maxilla separates from the face; and in the Le Fort III fracture, craniofacial dysjunction is present. The Le Fort II fracture crosses the nasal bones on the ascending process of the maxilla and lacrimal bone and crosses the orbital rim. The Le Fort II fracture extends posteriorly to the pterygoid plates at the base of the skull. A Le Fort I fracture is characterized by a low septal fracture, whereas a Le Fort II fracture results in a high septal fracture. In addition, most midface fractures have some degree of comminution and are complicated by fractures and displacement not addressed in the Le Fort system. These midface fractures include palate, medial maxillary arch, dentoalveolar, and anterior maxillary fractures. Palatal fractures were classified by Hendrickson et al, who described 6 types of palatal fractures, including the following: I, anterior and posterolateral alveolar; II, sagittal; III, parasagittal; IV, para-alveolar; V, complex; and VI, transverse. Palatal fractures are associated with Le Fort I fractures 100% of the time and with either Le Fort II/III or mandible fractures 50% of the time. There are many other classification systems for describing midface fractures. In the system of Donat et al, the face is divided into a matrix of vertical and horizontal beams, creating a lattice of 11 unilateral and 22 bilateral sites; this lattice is used to describe midface fractures. According to their preliminary data in 87 patients with midface fractures, this scheme enabled accurate transcription and communication among physicians 98% of the time. Another classification system is the Wassmund system. This system classifies fractures into grades I-V. A Wassmund I fracture is equivalent to a Le Fort II fracture. A Wassmund IV fracture is equivalent to a Le Fort III fracture. A Wassmund III fracture is characterized as a Le Fort III fracture without inclusion of the nasal bones. 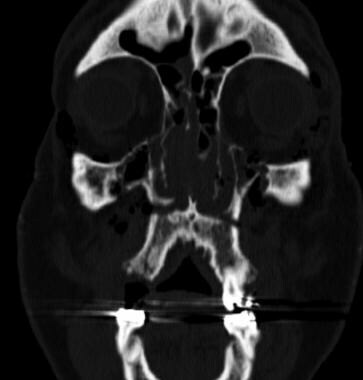 Manson described a facial fracture classification system on the basis of CT findings. He divided fractures into low- and high-impact fractures. The preferred radiologic examination is CT scanning of the facial bones, with coronal and axial sections in bone windows for maximal detail. 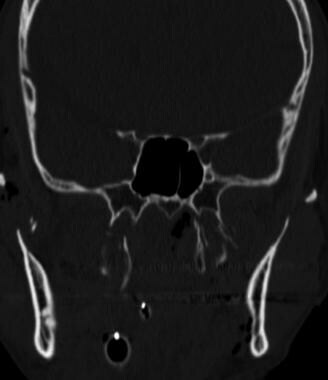 Midface fractures are best evaluated with CT imaging. [8, 9] Plain radiography and MRI play more limited roles in the evaluation of midfacial fractures. CT is not as suitable as MRI for assessing soft tissue changes and acute intracranial changes. Hardware and dental fillings can cause a scatter effect, making interpretation of fracture difficult in certain circumstances. Previously, an adequate examination of the cribriform plate, orbital roof, and orbital floor required images in the coronal plane, necessitating a direct coronal CT scan. However, to acquire a direct coronal CT scan, the cervical spine had to be cleared, and this could wast valuable time. Obtaining a direct coronal CT scan also increased costs, increased patient exposure to ionizing radiation, and required transport of a potentially unstable patient to the scanner itself. Angiography may be needed if there is concern about an associated injury to the carotid artery or internal maxillary artery (eg, to identify the site of arterial bleeding before embolization). For additional information about Le Fort fractures, see Maxillary and Le Fort Fractures. Plain radiographs are usually not ordered in complex trauma cases. The applicable plain images include facial bone series, which typically includes Waters, Stevens, and Townsend views. Plain radiographs have largely been replaced by CT scans for examining the midface. If there is concern about the possibility of a midface fracture, a CT scan is warranted. Panorex views are the best images for showing the orthognathic relationship and occlusion. 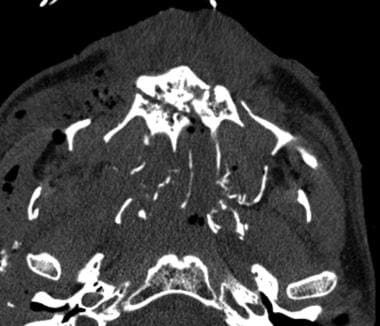 A Panorex view is especially helpful when associated mandible fractures are present. When imaging for Le Fort fractures, it is important to analyze the whole face for fractures, including the entire mandible, because of the high rate of fracture of the upper and lower face when midface fractures occur. The CT scan is analyzed in bone windows; 2- to 3-mm sections are preferred. A single-plane CT scan does not provide as much information as a 2-plane CT scan. It is crucial to use a systematic analysis in analyzing midface fracture CT scans. Axial sections are best for analyzing the posterior wall of the antrum, the pterygoid plates, the hard palate, dentoalveolar segments, the zygomatic arch and body, and the lateral wall of the orbit. Coronal sections provide the best images for analyzing the anterior wall of the maxilla, the inferior orbital rim, the palate, and the orbital floor. Reformatted CT images are also of high quality and have been shown to be reliable and accurate in surgical reconstructive efforts. With the introduction of helical CT, which acquires data in a continuous fashion, it is now possible to produce computer-reformatted images, either coronal or sagittal, from the standard axial images. Coronal images reformatted from helically acquired thin-section axial CT data have been shown to have high sensitivity and specificity in the detection of fractures, as compared with direct coronal imaging. Three-dimensional (3D) reconstructions (see the images below) are usually not necessary in analyzing midface fractures. However, these reconstructions may be useful in highly complex fractures or secondary reconstructions and in facilitating communication between the radiologist and the surgeon. [11, 12] Cavalanti et al have shown that 3D construction is quantitatively accurate for surgical planning and evaluation. Three-dimensional reconstruction of a patient with a right Le Fort III fracture and left Le Fort II fracture. In Manson's system, fractures are classified according to the displacement and the degree of comminution. In type I fractures, there is minimal displacement and no comminution. In type II fractures, there is moderate displacement and a small amount of comminution. In type III fractures, there is severe displacement, with the major buttresses comminuted in multiple locations. This system may serve as a dependable guide for determining the prognosis and proper intervention. 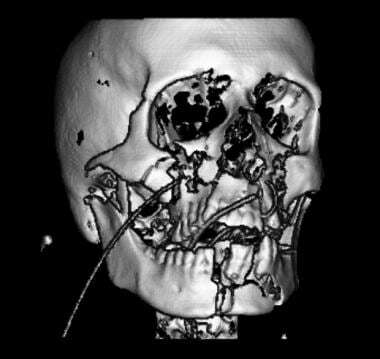 CT scanning is the criterion standard for detecting facial fractures. It is superior to clinical examination, and it is more than 95% accurate. Sagittal reformatted helical CT scans are comparable in quality to direct sagittal scans. CT scanning of a facial bone results in few false-positive or false-negative results. Koltai et al applied Manson's energy classification with CT scanning in children and found that CT is an effective way of determining the severity of fracture. The more severe the fracture, the more likely a repair is necessary. Misinterpretation of facial suture lines can cause an inexperienced examiner to diagnose facial fractures when none is present. MRI is typically performed 48 hours after trauma. The signal intensity of blood on T1-weighted images varies, depending on the age and location of the blood. 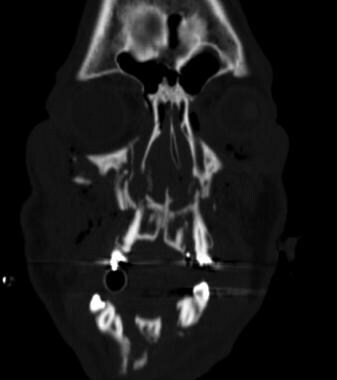 With regard to imaging the midface, the incidence of false-negative results are high with MRI, as compared with CT. Generally, a radiologist has a low degree of confidence in MRI findings when assessing a facial fracture; MRI plays an adjunctive role in the examination. MRIs are typically not helpful in cases involving acute bony trauma to the face, but if there is a question of soft-tissue injury to nervous structures, MRI may be helpful. MRI does have a role in cases involving intracranial injury or in cases in which unusual soft-tissue injury may be present. MRI is superior in the evaluation of brain and dural-space injury. Phillips BJ, Turco LM. Le Fort Fractures: A Collective Review. Bull Emerg Trauma. 2017 Oct. 5 (4):221-230. [Medline]. [Full Text]. Gasparini G, Brunelli A, Rivaroli A, et al. 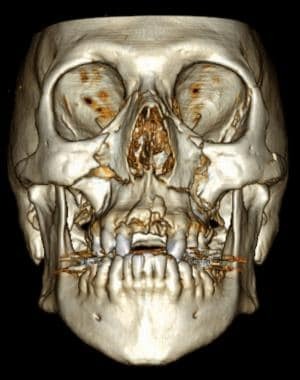 Maxillofacial traumas. J Craniofac Surg. 2002 Sep. 13(5):645-9. [Medline]. Fraioli RE, Branstetter BF 4th, Deleyiannis FW. Facial fractures: beyond Le Fort. Otolaryngol Clin North Am. 2008 Feb. 41(1):51-76, vi. [Medline]. Louis M, Agrawal N, Truong TA. Midface Fractures II. Semin Plast Surg. 2017 May. 31 (2):94-99. [Medline]. [Full Text]. Hoppe IC, Halsey JN, Ciminello FS, Lee ES, Granick MS. A Single-Center Review of Palatal Fractures: Etiology, Patterns, Concomitant Injuries, and Management. Eplasty. 2017. 17:e20. [Medline]. [Full Text]. Donat TL, Endress C, Mathog RH. 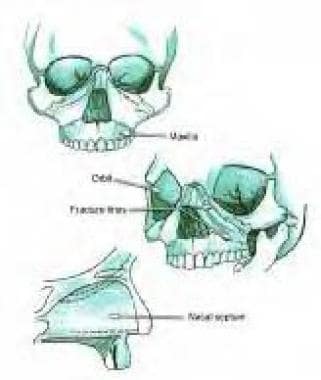 Facial fracture classification according to skeletal support mechanisms. Arch Otolaryngol Head Neck Surg. 1998 Dec. 124(12):1306-14. [Medline]. Patil RS, Kale TP, Kotrashetti SM, Baliga SD, Prabhu N, Issrani R. Assessment of changing patterns of Le fort fracture lines using computed tomography scan: an observational study. Acta Odontol Scand. 2014 Nov. 72 (8):984-8. [Medline]. Garg RK, Alsheik NH, Afifi AM, Gentry LR. Pterygoid Plate Fractures: Not Limited to Le Fort Fractures. J Craniofac Surg. 2015 Sep. 26 (6):1823-5. [Medline]. Mundinger GS, Dorafshar AH, Gilson MM, Mithani SK, Manson PN, Rodriguez ED. Blunt-mechanism facial fracture patterns associated with internal carotid artery injuries: recommendations for additional screening criteria based on analysis of 4,398 patients. J Oral Maxillofac Surg. 2013 Dec. 71 (12):2092-100. [Medline]. Rowe SP, Zinreich SJ, Fishman EK. 3D cinematic rendering of the calvarium, maxillofacial structures, and skull base: preliminary observations. Br J Radiol. 2018 Jun. 91 (1086):20170826. [Medline]. Eid M, De Cecco CN, Nance JW Jr, Caruso D, Albrecht MH, Spandorfer AJ, et al. Cinematic Rendering in CT: A Novel, Lifelike 3D Visualization Technique. AJR Am J Roentgenol. 2017 Aug. 209 (2):370-379. [Medline]. [Full Text]. Manson PN, Glassman D, Vanderkolk C, et al. Rigid stabilization of sagittal fractures of the maxilla and palate. Plast Reconstr Surg. 1990 May. 85(5):711-7. [Medline]. Buitrago-Tellez CH, Schilli W, Bohnert M, et al. A comprehensive classification of craniofacial fractures: postmortem and clinical studies with two- and three-dimensional computed tomography. Injury. 2002 Oct. 33(8):651-68. [Medline]. Chen WJ, Yang YJ, Fang YM, et al. Identification and classification in le fort type fractures by using 2D and 3D computed tomography. Chin J Traumatol. 2006 Feb. 9(1):59-64. [Medline]. Nan X, Fan Y, Li R, Wu Z. [Clinical application of three-dimensional spiral CT in the complexmaxillofacial fractures]. Hua Xi Kou Qiang Yi Xue Za Zhi. 2001 Dec. 19(6):372-4. [Medline]. The authors and editors of eMedicine gratefully acknowledge the contributions of previous author Galdino E Valvassori, MD, to the development and writing of this article.